On a sunny day in West Englewood, cars zoomed past as a new mural was being laid out on the side of 15th Ward Alderman Raymond Lopez’s office. What started out as a simple blue background took on layers of vibrant blue and purple tones, with dashes of yellow and white for contrast. Every now and then, artists Sam Kirk and Jenny Q. stood back to admire their work and gain perspective on what needed to be added next. 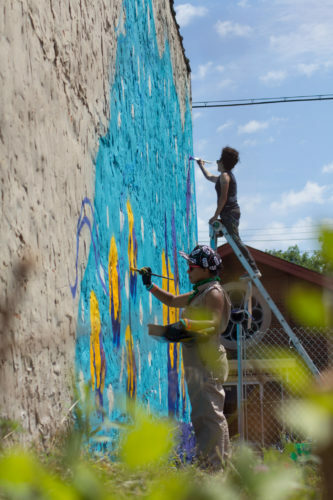 A small chain fence enclosed the area so Kirk and Q.—who have collaborated on projects before, including a mural in Casablanca, Morocco, and a coloring book called As Queer As I Wanna Be—were able to spread their materials out. On the other side of the fence, members of I Grow Chicago—a nonprofit in the neighborhood that provides safe spaces for residents to learn and practice art, health, and local impact—and the Shedd Aquarium were setting up for a small station area for kids to paint. The quiet area soon became alive with energy as the kids began to paint. Kirk and Q.’s mural was part of the Shedd’s new exhibit “Underwater Beauty,” which aims to showcase the beauty of a variety of species of aquatic animals. In addition to the exhibit and the murals, the Shedd curated a mobile aquarium that gave participants the chance to interact with local Great Lakes species and complete scientific activities. The mobile aquarium rolled through Douglas Park, Jackson Park, Altgeld Gardens, Auburn Gresham, Austin, and Humboldt Park in July. Caitlin McElroy, manager of government relations at the Shedd, pointed out that the mobile exhibit was another way to engage with youth in Chicago communities, and that while “people think of the Nemos and the fun bright fish as being really far out there, we have some really cool fish right here in the Great Lakes and in our rivers” that can help spark more interest in aquatic fields of study. 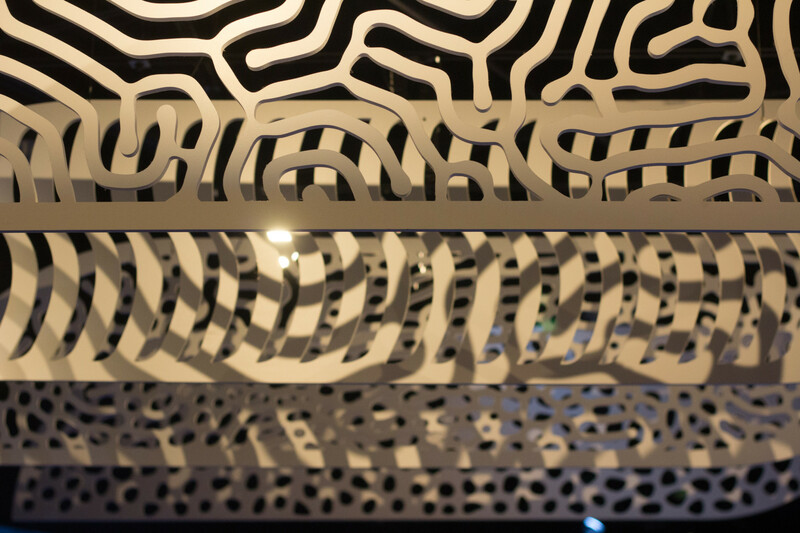 Sea creatures like the spotted sea jelly can be found swimming through one of the three important categories in the exhibit: Rhythms, Pattern, and Color. Walking through the exhibit places the viewer inside the ocean, with lighting evocative of ocean waves and a wide variety of fish species swimming by. You might run into the weedy seadragon, one of two species of seadragons that is usually found along the southern and western coasts of Australia. 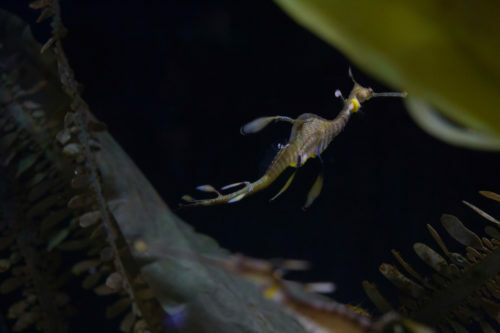 These seadragons are slow-moving and use their unique camouflage to resemble swaying seaweed to avoid predators. If you look closely, you may also spot the ribbon eel, which surprises everyone by flashing in and out of hiding. Scientists think the eel is a protandric hermaphrodite: although all eels are born male, they have the ability to transition from male to female when it becomes necessary for the survival of the species in their area. Following its opening, the Shedd commissioned five artists to create murals that help to draw students into taking more interest in aquatic beauty. The artists—Sam Kirk in West Englewood; Lavie Raven, who created a mural on the side of a beauty shop in Bronzeville; Jason Brammer, who painted on the side of a Logan Square bar; Caesar Perez, whose mural appears on the side of an Edgewater diner; and Anthony Lewellen, whose work appears on the side of a pub in west suburban Forest Park—were recruited by the Shedd to first view the exhibit in its entirety, and pick an animal that stood out to them for their mural. The spotted sea jelly, weedy seadragon, and ribbon eel all made the pick. Jo-Elle Mogerman, the Shedd’s vice president of learning and community, talked with the Weekly about this process, and how allowing the artists to choose what animals they represent in their murals helped them connect the idea of beauty to what residents are already familiar with. 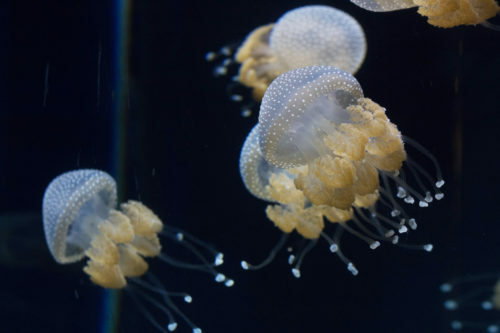 Mogerman said the Shedd wanted artists to go through the exhibit and take away “this notion that…[these animals are] so beautiful that [they’re] worth saving” and then “translating [that] in their own artistic way and through their own cultures, to put that back out to the city,” she said. As Raven painted, people and cars going by began to interact with the new work in different ways. One man stopped his car to get out and take a picture with Raven; others asked Raven questions about his technique and other murals; still others praised the ongoing work. 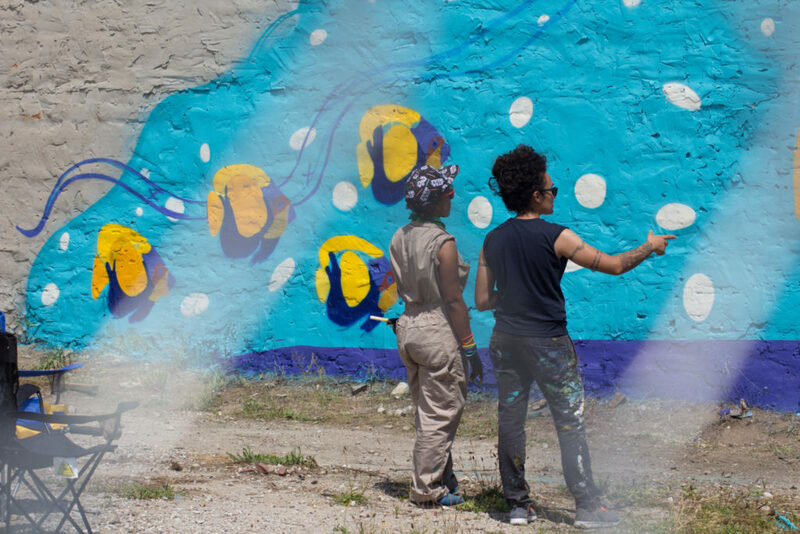 The community’s engagement with the art, especially in such a direct manner with the artist as the work was going up, chimed well with the Shedd’s vision for the murals as places for public engagement, and is part of what makes the process of creating a mural so important for the artist and community. Kirk created her own perspective of the underwater beauty exhibit in West Englewood. Like Raven’s mural, there was a lot of community interaction between the artists and the mural despite the chain linked fence that separated the paint stations for the kids and the mural being created. 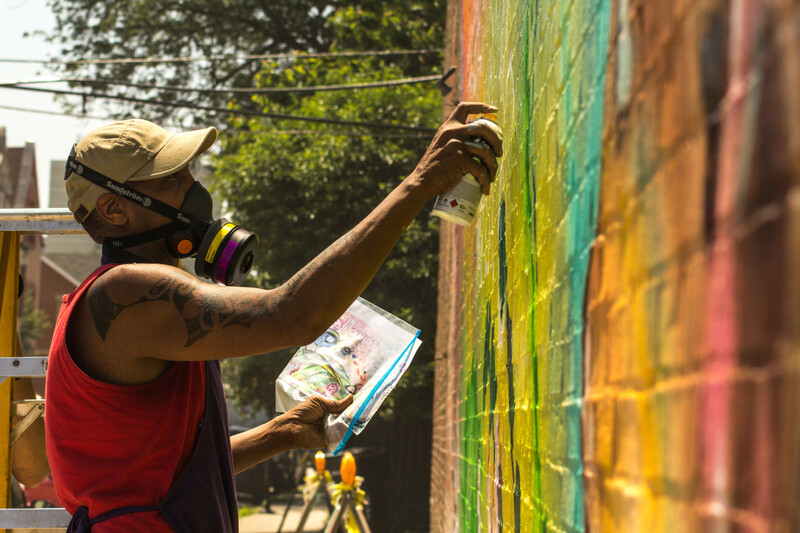 Rod Sawyer is a photojournalist based on the South Side, focusing mainly on covering graffiti and mural-art. He last wrote for the Weekly in May about the Hyde Park Art Center’s tribute to the Wall of Respect.